1. The location of Provincia (offices) is the capoluogo (main town of the district). 2. The way to use arms and gonfalone is determined by the "regulation". 3. The coat of arms, showing a golden lion rampant on a sky blue field and six alternating red and silver stripes on a (other) field, was granted to the Provincia by Royal Decree dated 13 November 1929. 4. The gonfalone, reproducing the arms of the Provincia, with a sky blue and yellow background, richly embroidered with gold and in the prescribed dimension, was granted by Royal Decree dated 7 November 1929. Correct me if I am wrong, but this royal decree surely "just" confirms the previous coat of arms of Gorizia as used by Austrian Emperors for centuries before. 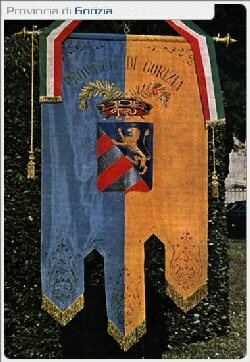 One would guess that Gorizia province was the legal successor of the unit in 1929 that was granted the arms. Maybe it is, though at that time it was still monarchy ... And, if it is not the legal "continual" successor, wouldn't it be better to quote the oldest grant giving such a coat of arms that would go several hundreds of years back in time. Then, of course, that one would not be Italian - so that might be an other reason. Anyway, just a bunch of speculations. 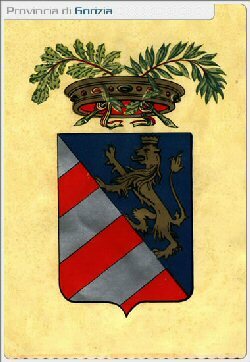 Another question that seems is not unique for Gorizia (may similar examples over here in Croatia) - how come the gonfalone was granted a week before the coat of arms, and still it includes that same coat of arms, which in theory did not exist until the end of the next week?